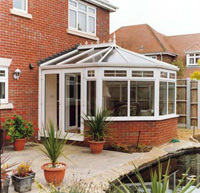 A Premier Conservatory is an ideal way to brighten up any home, it is a very practical extension to any living area that allows room for entertaining, working or just a place to relax. There are various roof styles available to suit all tastes and budgets from mono pitch lean-to systems to a stylish lantern top design, glazed with either a 25mm polycarbonate sheeting or the latest range of self cleaning glass units. The elevations are made with the same features and quality specifications as the rest of the product range.We also use the market leading Ultraframe Roofing System to produce a quality product that can be relied on for years to come. All roofs supplied are pre assembled in the factory so you are safe in the knowledge that what you have ordered will fit correctly first time.